The Wonder Winder ends extension cord spaghetti for good. With the Wonder Winder, you'll never have to waste time untangling and coiling extension cords again. It comes with two twist-lock mounting plates that attach to a wall of your shop, garage, or basement, or outside of your house--anywhere you have an outlet. You can then just move the Wonder Winder from one location to another as you need it. 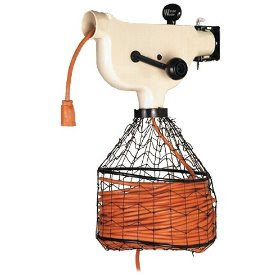 The unit's basket holds up to 75 feet of 12/3 cord, 100 feet of 14/3 cord, or up to 150 feet of 16/3 cord. Simply plug your tool into the cord end, and as you walk to your work area the cord follows. When you're done, press the rewind lever, turn the handle, and your extension cord is stored quickly and neatly for future use.